The farmhouse Grisun is a family-run farm plunged into a natural enviroment, where everything has its own rhythm. Maso Grisun offers its guests the opportunity to experience the nature and enjoy a warm and familiar atmosphere during their holiday. Hotel also features Residence. 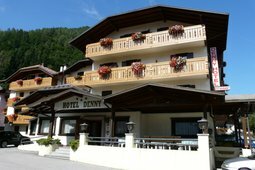 Family management, located in quiet area but within 10 minutes walk from the center of Pinzolo in the beautiful Val Rendena, at the mouth of the Val Genova and a few km from Madonna di Campiglio. 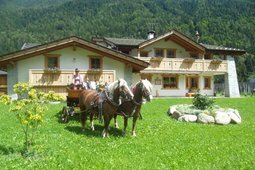 At the Alpina Hotel, you will find the atmosphere that you have always looked for: tradition, hospitality and friendliness. 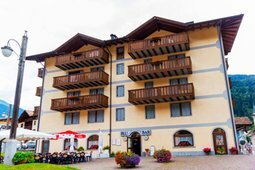 The hotel is located in the centre of Pinzolo, a short distance from the Doss del Sabion skilifts, included in the Madonna di Campiglio-Pinzolo Skiarea. 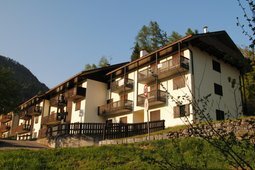 Apartments for rent in Pinzolo, in a very sunny position, with a wide convenient view to the center, 200 meters from the ski lifts of Skirama Pinzolo - Madonna di Campiglio - Folgarida and at a short distance from the Val Rendena cycle path. The structure has a free garage in the basement floor and a lift. The residence is located at the end of one of the main avenues of Pinzolo (viale Marconi), it is 200 meters far from the park and 500 meters from the ski lifts. 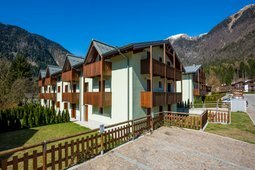 The Hotel Edelweiss in Pinzolo boasts a typical mountain style and is the perfect location for all those who want to spend a holiday in the green nature of Val Rendena. This family-run hotel has a long tradition and is the ideal starting point for hikes and ski tours. The residence Holidays Dolomiti lies in a quiet position, just 150 m from the centre of Carisolo. Located at the entrance of Val Genova, in the heart of the Adamello Brenta Nature Park, 10 km far from Madonna di Campiglio, it is an ideal place to spend a healthy relaxing holiday. 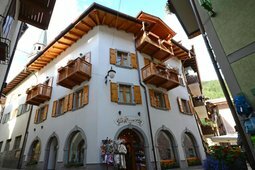 Are you looking for apartments for rent near Madonna di Campiglio or Pinzolo? The Residence La Rosa delle Dolomiti in Carisolo is located in the Adamello Brenta Nature Park, a few steps from Pinzolo and a few kilometers from Madonna di Campiglio. The house is located in the pedestrian area in the centre of Pinzolo. 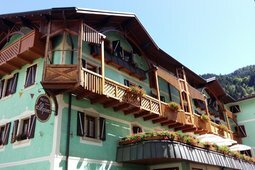 The apartments were designed in Tyrolean style, are located on the second and third level of the house and can be accessed by a lift. The furnishings are in natural pine wood.